This is a truly one of a kind collectible! 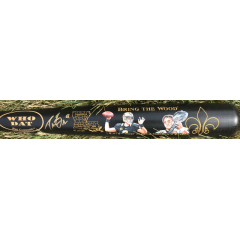 This Who Dat Bat Company bat commemorates Brees' most passing yards in a season record from 2011 in which he threw for 5,476 yards. The bat comes signed by Drew Brees with his signature coming fully authenticated by JSA. Added to the bat are two hand painted original works of art of Brees. The art comes signed by the artist and also comes with a letter of authenticity. There is no other item in the marketplace like this making it a one of a kind bat. Order now before it is sold! Due to the very rare nature of this offer we must charge your credit card for the full price immediately upon taking your order. This policy ensures we reserve the bat for you. We will confirm your order by email.